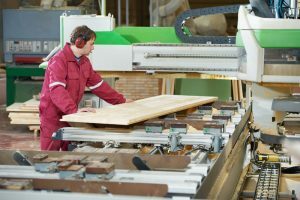 If you’re visiting this site because you manufacture furniture or cabinets, you know how important it is to know and control the moisture content of the wood. You’ve probably seen firsthand how even small changes in moisture content can lead to big problems later on. We at Wagner Meters know that’s the reason many furniture/cabinet manufacturers we’ve served over the years say a moisture meter is their go-to tool and the first thing they grab when handling any wood for the first time. They consider it good insurance and a cost-saving management tool for their business. Because a quality moisture meter is indispensable when working with wood, we’ve taken great pride throughout our 50-plus years making the highest quality meters money can buy. It’s hard to improve on perfection, but we’ve done it! It’s with great excitement that we introduce to you our newest, most innovative wood moisture meters we’ve ever developed: Orion. Pinless. No one wants to see holes in wood intended for fine furniture or costly cabinets. Nor do we. That’s why all Orion meters are pinless. No holes also means no hassles filling them in or fooling with wood glues and stains to cover them up. Exceptional accuracy. When you’re building fine crafted furniture or manufacturing exquisite cabinets, we suspect you don’t want to use a cheap “bargain” moisture meter. Many economy brands are poorly made and come with a larger margin of error in the lower range of moisture content measurement– the range most critical for your creations. 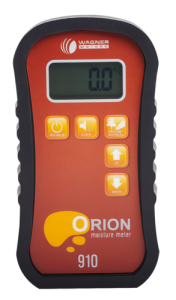 On the other hand, Orion meters, designed and assembled in the U.S., come with the highest degree of accuracy. So you never have to doubt its reliability or accuracy. On-site calibration. Orion also gives you every-day assurance that your meter stays accurate and meets factory standards. How? By putting calibration in your hands! That’s right, Orion is the only meter in the marketplace that enables you to recalibrate your meter if needed. Yes, some brands give you the option to “check” calibration, but if calibration is needed, guess what? You have to send it to the manufacturer – costing you time and money. Calibration is fast and easy using our On-Demand Calibrator. Takes all of one minute! This assures you your Orion meter is always performing according to factory standards for the life of the meter. Additionally, a NIST-traceable version of the On-Demand Calibrator is available, so if your company is ISO-certified, this is very important. Dual-depth. 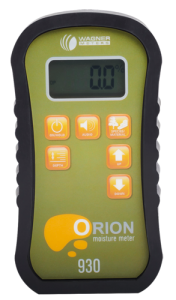 Whether you take moisture readings of thin or thick woods, Orion has you covered. Our shallow depth mode measures thin woods (1/4-inch or 6.35mm thick), while our deep depth mode handles thicker pieces (up to 1.5-inches 38mm thick). Data collection. Need to do quality assurance of the wood stock shipped to your shop? No problem. 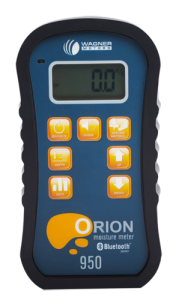 With its ability to collect data, Orion allows you take up to 100 high/low/average moisture content (MC) readings. You then can gauge if the wood your vendor sent you meets your highest standards. Our premier Orion model is also Bluetooth®-enabled. This allows you to store the data you collect on a computer or smartphone, print it, set specifications for separate jobs, and more. Relative moisture measurement. Should you use particle board, medium density fiberboard (MDF), or any other non-wood product in your cabinets or furniture products, the Relative Moisture Measurement Mode on Orion allows you to easily compare moisture levels. Equilibrium moisture content (EMC). Need to check your wood stock to determine if it’s reached equilibrium with its environment? Using data from its built-in temperature/humidity sensor, Orion will calculate the EMC of your wood. The sooner it reaches EMC, the sooner you can start manufacturing with it. Industry-leading 7-year warranty. Wagner Meters stands behind Orion like no other company. As proof, we offer you an industry-best 7-year warranty. You not only get the industry’s most advanced moisture meter, but you get peace of mind knowing you’re protected should any problems arise (most unlikely). Orion 910 is the entry to the Orion line. Featuring deep depth readings up to 1.5-inches (38mm). It’s ideal if you want to replace Wagner’s MMC220 legacy meter with one offering even greater functionality and accuracy. 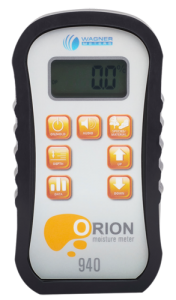 Orion 930 offers dual-depth readings. Shallow depth is great for veneers, thin woods, or to check how dry your stains are. Deep depth is ideal for checking thicker wood samples. Orion 940 features dual-depth readings and data collection – ideal for checking the high/low/average MC of large volumes of wood. Orion 950, our most advanced model, comes with all the functions and features of the meters above. It also comes with a built-in temperature/humidity sensor, calculates EMC, and is Bluetooth app-enabled, allowing you to send data to a computer or smartphone, and much more.